Georgia O’Keeffe, Jimson Weed/White Flower No. 1, 1932. Oil on canvas, 48 by 40 inches (121.9 by 101.6 cm). The Georgia O'Keeffe Museum / Artists Rights Society (ARS), New York. Considering the way artists see is one of the most enjoyable games we can play while looking at art. On a recent visit to the Georgia O’Keeffe Museum in Santa Fe (217 Johnson St.), a certain landscape called “Red and Yellow Cliffs” compelled me to stop and look closer. In it, a palette of cream, buttermilk, ochre, sage, rust and deep, dry green gives form to the cliffs. A towering clay escarpment rests on warm, fleshy folds, stretching upward, while sliding rubble pulls the whole thing down to Earth. The cliffs are massive. They nearly stamp out the tiny shrubs cushioning their base. They crowd out even New Mexico’s sky, pushing it so far out of frame that its distinctive expanse is reduced to a patch and a sliver at the top left. 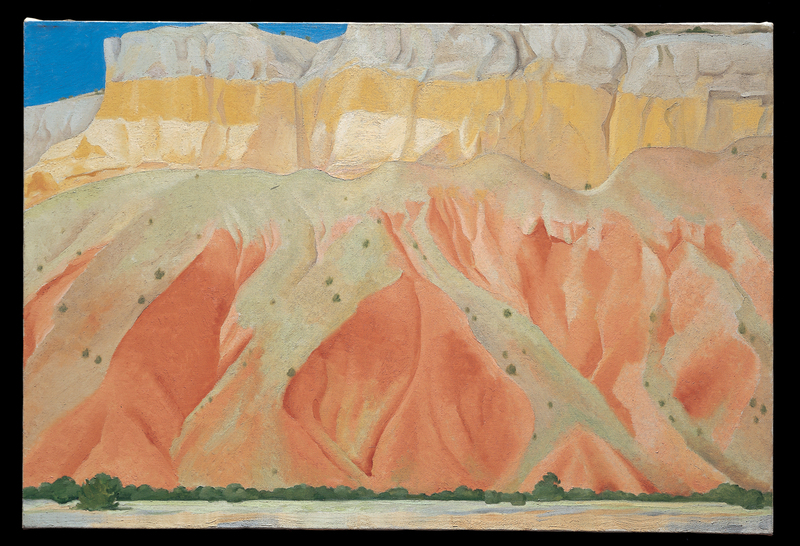 Painted in 1940, the year O’Keeffe bought a Ghost Ranch adobe nestled beneath these very cliffs, this painting tells the story of a new home, a new life. It is all land. And as I look longer and slowly unravel it, I too feel at home. At the time I hadn’t an inkling that across the country, Sotheby’s was preparing to auction off three paintings from the O’Keeffe Museum’s permanent collection: “On the Old Santa Fe Road,” “Untitled (Skunk Cabbage)” and “Jimson Weed/White Flower No. 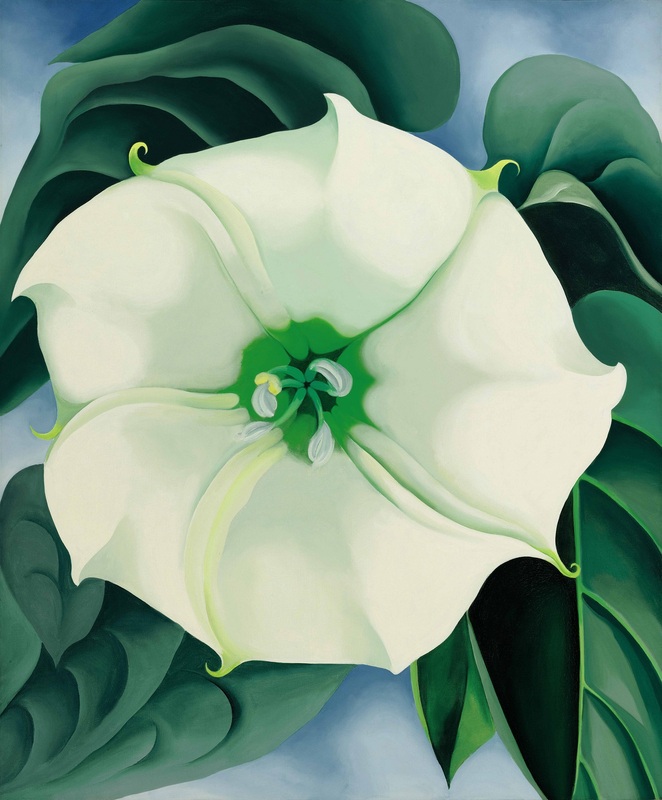 1.” Estimated to bring in $10-15 million, “Jimson Weed” (1932), described by Sotheby’s as “one of the most iconic works by Georgia O’Keeffe ever to appear at auction,” ended up bringing in over $44 million, breaking the record for the highest-selling artwork by a woman. Suddenly I’m in the middle of it, focused on the smaller, sharper details: the subtle curvature of the pistils set around the very center, dark and deep. It is all flower, and I realize that this is exactly what she wanted—for me to find myself here. 3 9/16 in. Georgia O’Keeffe Museum. Gift of The Georgia O’Keeffe Foundation. So I ask Cody Hartley and Rob Kret. Why “Jimson Weed”? What makes this painting so iconic and so special? Impressive indeed, but I’m still not sold on “Jimson Weed.” I give it another go. O’Keeffe purportedly first encountered the flower in northern New Mexico on one of her early visits to her future home. It held some meaning for her, then. With that in mind, I pull up an image of the painting and imagine it looming large in front of me. I allow it to just be there, to gradually unfold. The circular arrangement of the leaves and shape of the flower urge me inward and suddenly I’m in the middle of it, focused on the smaller, sharper details: the subtle curvature of the pistils set around the very center, dark and deep. It is all flower, and I realize that this is exactly what she wanted—for me to find myself here. Here, as with the landscape, O’Keeffe gives form to the experience of being swallowed by proximity and scale and intrigue. I sense a quest for understanding. This isn’t just a painting of a flower, but a desire—and an invitation—to get closer, to look intently and to experience wholly. Both Kret and Hartley mention their own appreciation for O’Keeffe’s “determined intentionality,” her commitment to living, her ability to immerse herself in the world. “It’s great that we have people coming to the galleries and experiencing her work, but I think it’s only half the experience. Getting out and experiencing the landscape of New Mexico is the rest of the story,” says Kret. That is the power of someone else’s insight—and particularly someone who is a practiced observer. What if we went out, experienced and wondered, filed away our observations and applied this fresh perspective to our own world and the things within it? If we looked like O’Keeffe looked, where might a simple white flower or the hills up the highway take us? Hours: Sunday through Thursday, 10am to 5pm; Friday, 10am to 7pm; Saturday 10am to 5pm. Closes at 3pm Christmas Eve and New Year’s Eve. Closed Christmas and New Year’s Day. The first Friday of the month is FREE for New Mexico residents and their guests (up to 10 guests); valid New Mexico ID required.